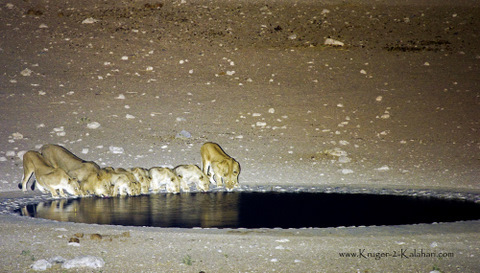 Lion pride drinking at the Dolomite camp waterhole. Photographed from 300 meters away at night. Have You captured any magical 'Etosha moments' such as these...? Photographs freeze these moments and allow you to share them with others. Many visitors to Big-5 game reserves take hundreds of great animal pictures but then never look at them or share them – they remain on a computer or CD for the rest of their days – what a waste!! Keep in mind that we have sold some of our photographs just by displaying them on this website. This is how it tends to go - we get an email from a publisher saying that they have seen one of our photographs that they would like to use in their next magazine and they are prepared to pay us US$175,00 for the high-res photograph! Share Your Etosha Safari Pictures and Stories! If you've been to Etosha and love it as much as we do, please do share your experiences, advice and tips! We would be keen to try them on our next Etosha Safari and I'm sure others who visit this site will as well! •	Perhaps you’ve had a very good, or very bad, Etosha experience? •	Maybe you have a favorite camp? •	Do you have a funny story to tell? •	Have you captured any special Etosha Photographs? Do You have an Etosha picture to add? Great! Click the button and find it on your computer. Then select it. Important Note: The maximum image size accepted is 800x600. You may need resize any photo larger than 800x600 pixels using your graphics software or a Web-based resizer, such as Picnik. These photos were taken during our March trip to Etosha. They were then manipulated in PS. Hope you enjoy. When in Etosha this past September, we were able to photograph a group of Zebra playing rough. Look closely they were playing very, very rough. The kids have grown the boys will soon be out? While sitting at Moringa, a herd came to there waterhole. The Babies are of course the attraction, but the teenagers where not far behind. It is not always the lions, leopards and cheetahs that make a visit special. There are also other animals to photograph and enjoy. Here are a few. While sitting at the Okaukuejo waterhole, i experimented photographing giraffes drinking and silhoutes at sundown. Here are the results. Came acroos this behaviour at Rietfontein Waterhole. Thought that the tour operartors knew better??? Who says lions dislike water? As there was some interest in the previous post on the lion pride we photographed at the Goas water hole here are a few more. Hope you enjoy. Etosha is one of the best areas to photograph wild animals! A dusty charge of elephants to Rietfontein Waterhole in Etosha - and look who is leading the charge!! This elephant soaked his feet, had a long drink and then moved off. Out of the way, please sir! A Black Rhino heading our way at Goas waterhole at dusk. A Black Rhino at Goas Waterhole. Elephants in Etosha - What an experience!